1. Heat a large nonstick skillet over medium-low heat. Coat pan with cooking spray. Add 1 cup onion and garlic; cook for 10 minutes or until tender and golden brown, stirring occasionally. 2. Sprinkle 2 tablespoons cheese over each of 4 bread slices. 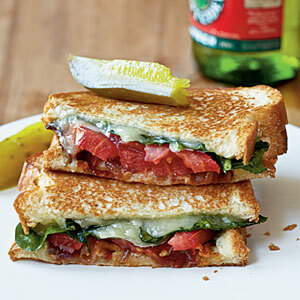 Top each slice with 1/2 cup spinach, 2 tomato slices, 2 tablespoons onion mixture, and 1 1/2 bacon slices. Sprinkle each with 2 tablespoons cheese; top with the remaining 4 bread slices. 3. Heat skillet over medium heat. Coat pan with cooking spray. Place sandwiches in pan, and cook for 3 minutes on each side or until golden brown and cheese melts.